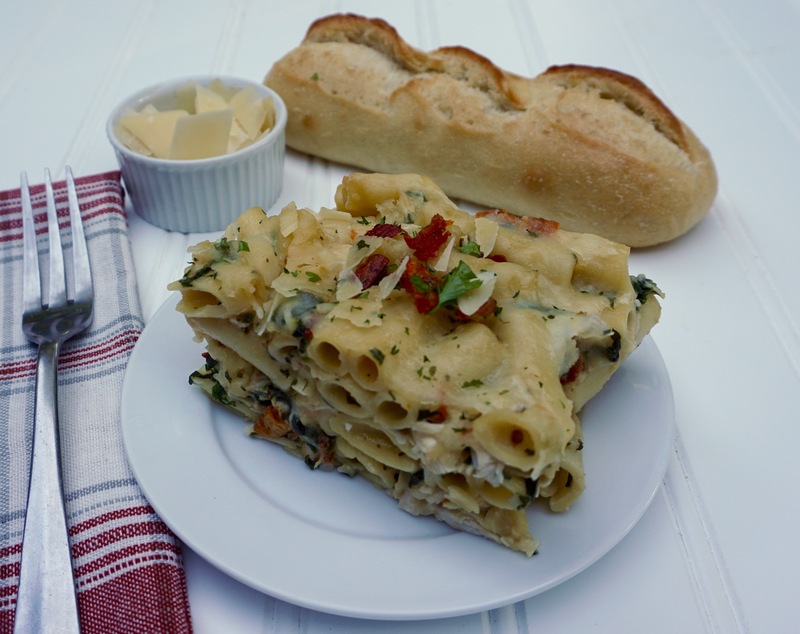 Tuscan Chicken Baked Ziti is a creamy,flavorful baked pasta dish. 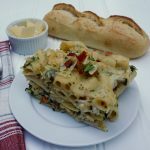 Tuscan Chicken Baked Ziti is one of those easy recipes that you can use in a multitude of ways. It is great for entertaining because you can assemble it ahead of time and bake it when the guests arrive, leaving you to enjoy yourself instead of worrying over last minute details! 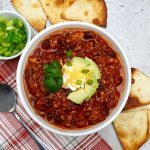 You could also make it over the weekend and bake it for a weeknight dinner. There is something comforting about knowing you have a nice warm dinner to look forward to at the end of the day. 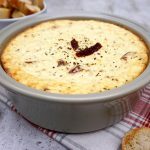 Versatile, make ahead dishes are something we all need as we head towards the holidays! 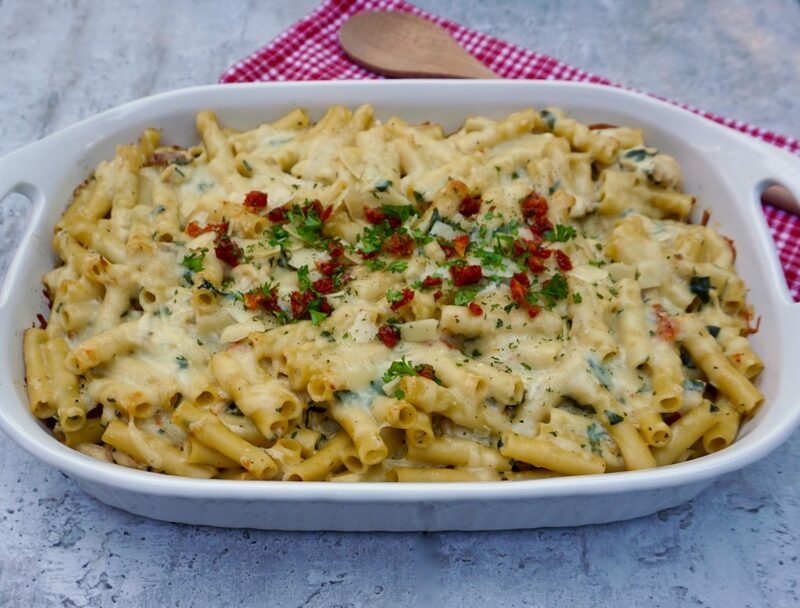 This Tuscan Chicken Baked Ziti is creamy and full of flavor, but not heavy. Make it part of your planning ahead, fall line up. 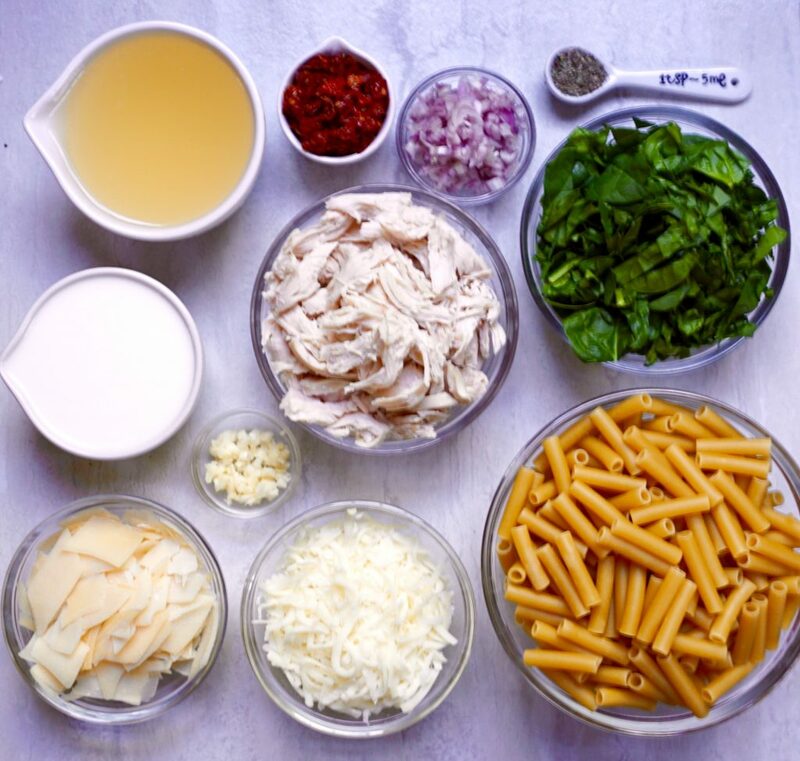 Set aside ½ cup of the mozzarella cheese and ¼ cup of the parmesan cheese for topping the ziti. Cook the ziti so that it is still slightly firm. Deduct one minute from what the directions on the box call for el dente. Drain the pasta and return it to the pan. In a large saucepan, heat the olive oil over medium low heat. Add the shallot and garlic and cook for 2-3 minutes, stirring occasionally until they just begin to soften. Add the flour and combine thoroughly. Slowly ad the chicken broth to the flour mixture, whisking constantly. Slowly add the milk. Turn the heat up to medium and continue whisking the mixture until it comes to a boil and thickens. Pour the sauce over the ziti in your large pan. Add the chicken, sun dried tomatoes, spinach, 1 cup of the mozzarella and ¾ cup of the parmesan cheese. Combine well. Lightly oil a 9 x 13 inch baking dish. Add the ziti mixture to the pan. Combine the reserved mozzarella and parmesan cheese and sprinkle over the top of the ziti. Bake at 350 degrees for 35 minutes, until it is heated through. *For 3 cups of shredded chicken, you will need one pound of boneless chicken breast. Check out this link on How To Bake Chicken Breasts.